CPM, Ireland’s leading field sales company, takes a look at the Irish retail news for this week. Every Wednesday we share the recent announcements. This is a one stop shop for all your Irish retail news. The ‘Digital Marketing in Retail/FMCG’ Seminar will take place in the Chartered Accountants House off Pearse Street, Dublin, on Tuesday, July 22. This one-off seminar hosted by Checkout in collaboration with the Digital Marketing Institute is for executives within the retail and FMCG sectors seeking to fine-tune their online strategy and help their brand flourish in the digital age. Irish people look for value, cleanliness and convenience when it comes to deciding where to shop. That is according to ‘How Consumers Shop 2014’ by global property advisor CBRE, which surveyed 1,000 shoppers across the country, asking them what they look for when choosing where to shop for non-food items. The volume of retail sales in Ireland increased by 0.9% in May compared to April, according to statistics released recently by the CSO. What’s more, the value of retail sales increased by 0.6% over the same period, and retail sales are up 4.1% on the same month of last year. The FIFA World Cup is still expected to provide a welcome boost to retailers, as 47% intend to watch the football tournament despite Ireland's failure to qualify. Research published today by ecommerce partner Webloyalty found that retailers with snacks could see a sales boost of 19%, and an 18% boost for retailers offering pizza and other fast food items. Only 7% say that they will purchase alcohol for home consumption during the games, compared to 11% who will purchase non-alcoholic drinks for home viewing. Research commissioned by shopper marketing specialists Visualise shows that 90% of Irish shoppers say price is one of the main contributing factors when choosing where to shop. 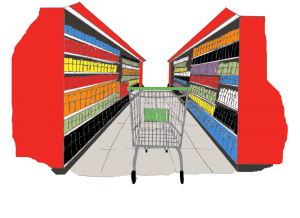 Only 2% of shoppers do their full grocery shop in one store, while 90% say that price is one of the main contributing factors when choosing where to shop, according to new research commissioned by shopper marketing specialist, Visualise. International translation expert and director of the Association of Language companies, Richard Brooks, has expressed concern that major food retailers are ill-prepared for the new EU Food Information Regulation (FIR). His main worry is not the time pressure, but the precision of the labelling. Demonstrating bread's prominence in the Irish consumer's diet, new consumer research by Bord Bia reveals 57% can't imagine life without bread. The results show some interesting similarities and differences between the ROI and UK markets. RoI baked goods shoppers are more likely to plan their purchases in advance, while UK shoppers show a greater propensity to buy on impulse. New packaging and processing technologies are extending the shelflife of fresh and processed meat. This is according to a new report by RaboBank, ‘Meat Packaging To Extend Shelflife,’ which found that the meat industry continues to reap the rewards of technological innovation, including expanded geographical sales coverage, better margins across the value chain, lower environmental costs of meat consumption and product premiumisation. More than 300 jobs are being created in food business startups as a result of the Food Academy Start programme, a collaborative initiative between the Local Enterprise Offices, Bord Bia and SuperValu. Over the next 12 months, the food start ups will produce and supply SuperValu stores across the country. The improving economic outlook has seen – and will see – renewed investment in vacant retail parks and shopping centres across the country, according to a report released today. Commercial property consultants CBRE Ireland today released their latest bi-monthly analysis of trends in each sector of the Irish commercial property market. According to their July bi-monthly report, the first six months of 2014 have seen strong volumes of activity being recorded in all sectors of the market, including retail property. Foodworks, the enterprise initiative comprising of Bord Bia, Enterprise Ireland and Teagasc, is set to launch some new food and drink products. Dairy free ice-cream, biodegradable chewing gum, premium Irish vodka and sustainable seafood butter are just some of this year’s launches. Spar Ireland is set to continue its partnership with Donal Skehan after agreeing a new €275,000 package to sponsor RTE’s ‘Kitchen Hero’, as well as his live tour later this year. The upcoming season of the show – which starts on June 24 and finishes August 5 – is themed on ‘rediscovering the Irish Kitchen’ and will revisit and revitalise some of the country’s classic dishes. The previous series attracted over 240,000 viewers per episode.